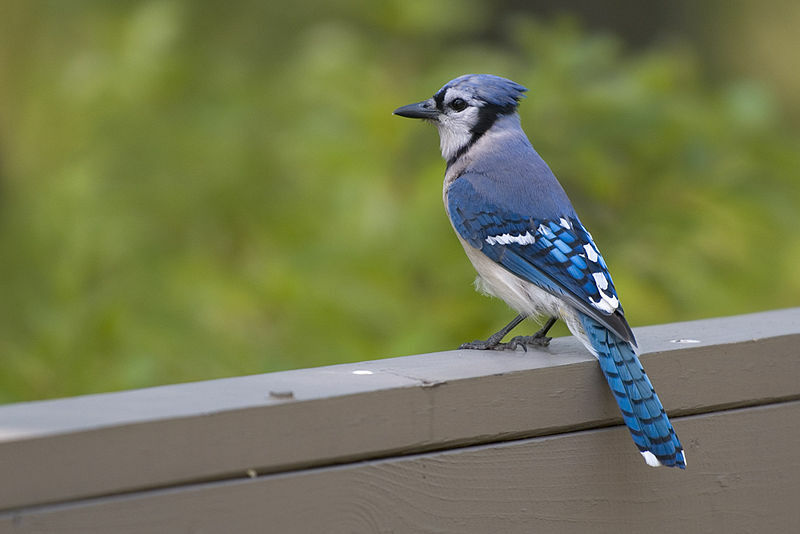 Belongs to the "blue" or American jays, which are, among the Corvidae. It is adaptable, aggressive and omnivorous, and has been colonizing new habitats for many decades. wingspan of 13–17 in . The Blue Jay has a pronounced crest on the head, a crown of feathers, that can be raised or lowered according to the bird's mood. When excited or aggressive, the crest may be fully raised. When frightened, the crest bristles outwards, brushlike. When the bird is feeding among other jays or resting, the crest is flattened to the head. Blue Jays have strong black bills used for cracking nuts, and acorns and for eating corn, grains and seeds, although they also eat insects such as beetles, grasshoppers, and caterpillars. Blue Jays can make a large variety of sounds, and individuals may vary perceptibly in their calling style and they may learn to mimic human speech. Blue Jays also have quiet, almost subliminal calls which they use among themselves in proximity. The Blue Jay occupies a variety of habitats within its large range, from the pine woods of Florida to the spruce fir forests of northern Ontario. It is less abundant in the heavier forests, preferring mixed wood and deciduous forest areas, especially where there are beech, hazel, and oak trees. Most corvids are non-migratory, but some wander about, often in small bands, after the breeding season.